Water district hopes to reduce the electricity bill by going solar. The Oak Bluffs water district is hoping to offset operational costs by developing a large solar array on property it owns off Barnes Road. The three-megawatt array would cover about four acres on land that includes three public wells that draw from a sole source aquifer. Nearly half the 45-acre wooded site would be cleared for the project, which is still subject to a wide range of local and state review. The Martha’s Vineyard Commission will open a public hearing next Thursday to review the project as a development of regional impact (DRI). Other review agencies include the Department of Environmental Protection and the Natural Heritage and Endangered Species Program. If it clears the MVC, the project will also need approval from the town zoning board of appeals and building inspector along with a site plan review committee. The water district, which operates as its own governmental entity, hired BlueWave Capital and SunEdison last year to permit and build the project. District superintendent Kevin Johnson said the project would cut the district’s energy costs by 40 per cent, allowing for continued improvements to pipes and other infrastructure. “Our involvement is to basically reap the benefits of having a solar field on property that would not be able to be used for anything else other than for a well field,” he said. The savings would likely not translate to lower water bills, he added, although some of the solar credits would be distributed to the community, and some would be offered to the town for purchase. Public concern has focused on the project’s visibility from Barnes Road, where a bike path skirts the eastern edge of the property. Some have worried about noise, although Mr. Johnson said electrical equipment would be located out of earshot, in the center of the array. The nearest house is 280 feet away. Commission maps designate the area as permanently protected open space, since it is owned by the water district. The land also abuts the state forest in Edgartown and two districts of critical planning concern (DCPCs), in Tisbury and West Tisbury. The NHESP has recommended, among other things, a local seed mix to help stabilize the cleared area, but does not anticipate the project needing a conservation permit. Other concerns focus on the water resource itself. The federal Environmental Protection Agency defines the area as a sole-source aquifer, since it supplies more than half the drinking water for the area, and there would be no alternative sources in the event of contamination. “The question I think is going to be . . . if clearing that much acreage over the recharge area will potentially have any effect on the ground and the water going back into the earth,” said Fred Hancock, an Oak Bluffs representative on the commission. He said he believes this is the first time for the MVC to review a solar project in a well recharge area. Developers have billed the project as a passive use of the land. “It shouldn’t affect the wells at all,” Mr. Johnson said, explaining that the panels would be mounted on poles rather than concrete pads, and that the contractors would work to contain any contaminants during construction. The plan also calls for improvements to Little Pond Road along the northern edge of the property, to allow for emergency vehicle access. 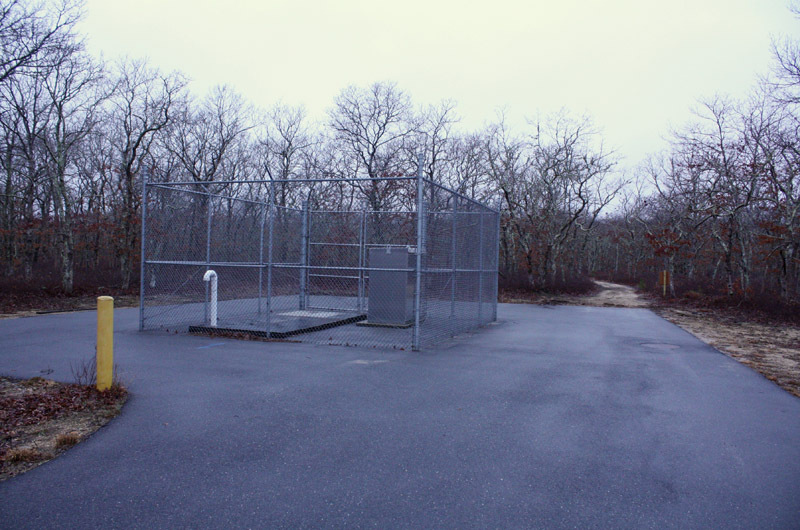 An existing paved road provides access to the three wells and other district facilities. The 400-foot buffers around each wellhead (known as zone one) are almost entirely within the project area, although Mr. Johnson pointed out that the area of contribution (known as zone 2) extends well into the state forest. “Our control over the project is to make sure that the requirements for zone one are maintained,” he said, noting that town boards would also weigh in. “There is a vetting process in the town that I think is extremely thorough,” he said. A solar energy bylaw adopted last year requires additional layers of review, including consideration of open space, visibility and land clearing. Among other things, the bylaw sets a two-year limit on construction, and requires that all systems be removed at the end of their life spans. Contractors have yet to submit their plans to the DEP, which has specific guidelines for solar arrays around town wells. Solar projects in zone one must have “no significant adverse impact on water quality,” the regulations state, and no contaminants may be stored onsite. The DEP also requires that a portion of the solar energy be used to benefit the operation of the water system. A guideline document for communities issued by the state last year notes that solar power transformers could release contaminants if they break or catch fire, but that modern transformers typically contain non-toxic coolants and are not considered a health risk. Some solar panels contain harmful chemicals such as cadmium telluride, but most are made of silicon, the document adds. Representatives for BlueWave Capital did not immediately respond to questions about whether the proposed solar panels would contain harmful chemicals. SunEdison, a renewable energy company based in Missouri, received a score of less than 15 out of 100 from Silicon Valley Toxics Coalition, a research and advocacy group, in 2015, based on several factors, including module toxicity and whether it had a plan for reducing its use of chemicals. BlueWave Capital was not on the list. Oak Bluffs health agent Ade Solarin did not believe the solar array would present a public health risk, but noted that the DEP would provide key oversight. “Based on my review, I don’t see anything that would contaminate our water resource,” he said. The public hearing at the commission begins at 7 p.m. Thursday, March 3, in the commission office in Oak Bluffs. Cutting down 20 plus acres of trees for a 4 acre solar project seems counter productive to ecological sustainability, particularly when the current solar technology being offered is suboptimal. At some point in time we are going to have to stop doing things under the notion that future generations will just clean up our messes for us, and start becoming more responsible and clear minded about our current actions while moving forward. So well said T.S.! Cutting down all those trees in the name of solar power is a non-sequitur. I hope the MVC will stop this project. And I ask the selectman to vote, unanimously, against it! Once a photon is absorbed it can not be renewed. Why clear all that Land when you only need 4-5 acres for this size project. It just does not make sense. I would rather look at trees and brush and the wildlife they support than look at an open field highlighted by aluminum and glass (The PV field).Leave the trees and brush for our wildlife.